← Fertility. The Foundation of Life. I think it is fair to say that we are glass jar fans, that we are glass jar enthusiasts, that we are glass jar lovers. 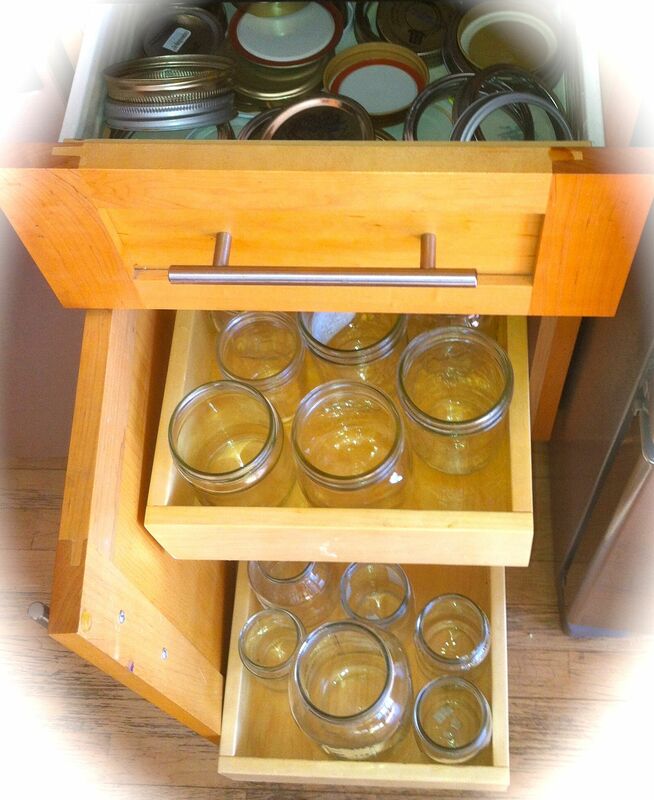 In fact, we have a whole counter cabinet dedicated to glass jars and their oh-so-precious lids centrally located in our kitchen right next to the fridge. At first, it seemed a little silly to keep only glass jars in there, but now, we can’t even fit them all and have had to find overflow locations as well. I am not embarrassed to admit that I preferentially choose food products (like spaghetti sauce, jam, and apple sauce) by the type of glass jar they come in… What is the shape of the jar? What is the opening like? What kind of lid? I’m a sucker for a good wide opening with a standard sized lid. Who isn’t? Dinner leftover. Everything from soup to spaghetti, risotto to salad, roasted veggies to black beans can be quickly stored in the right mason jar. Cooking Ingredients. If I’m shredding zucchini, I’ll make twice as much as I need and store the rest in a glass jar. If I have a little extra ganache, I can’t bring myself to waste it, so it goes in a glass jar and gets reused. Frozen sweets. I make a double batch and freeze half in glass jars to double the pleasure form fresh baked goodies. Restaurant take-away. We (actually) bring glass jars with us to restaurants to prevent the inevitable question “What kind of takeout packaging will they bring if I ask to take home the rest of the basil fried rice? Plastic? Tin? Styrofoam?” All various levels of waste sins. Nuts and dried fruit. Once you open those packages, nuts and dried fruit will go bad pretty quickly. So, we put them in glass jars and they stay fresh and delicious for weeks. Meat and cheese. If you really want to extend the life of meat and cheese, put them in a glass jar. On-the-go snacks. While dry munchies usually go in tins, fruit seems to do best in glass jars, so we throw sliced apples or oranges into a snack cup sized jars and go on our way. Homemade nut butter. This really makes it look professional. Holiday gifts. I make cookies or fudge to hand out to my family and friends and it always come securely wrapped in a ball mason jar. It’s a double gift, because they get the sweets plus the joy of the jar. Nails and screws. We sort all those pesky fasteners into see through jars. Art supplies. Buttons, cotton balls, popsicle sticks – all easily stored and visible in glass jars. Clay and Play-doh. Stays moist and ready for the next use. Seeds. We save those precious seeds in a clean dry environment until it’s time to plant them. Drinking glass. This is really only in a pinch, but the straight edged glass jars do make perfect drinking glasses, especially outside where they are more likely to get dropped. Flowers. I can never seem to get flowers to sit right in a vase, but they look great in a glass jar. This works really well for a single flower or for a short bunch. Silverware on a buffet. When we’re having a dinner party, we drop forks, knives and spoons neatly into bell jars from grabbing. Bulk food storage. Dry beans and rice are stashed in the back of our pantry neatly in glass jars. Pencils, markers, crayons. Easily accessible in a glass jar. Slap a lid on and now you have a handy take with you activity set. Homemade maple syrup. This stuff is liquid gold, and we wouldn’t dream of storing it anywhere else. Fresh baked cookies. A large glass jar with a good sized opening (for little hands to grab) is perfect cookie jar. Chocolate chips. I usually keep an inventory of semisweet chocolate chips, milk chocolate chips, and mini chocolate chips. As soon as I open the bag, the chips go into a glass jar (spaghetti sauce jars tend to be really good for chocolate chips, because they are good for pouring and sprinkling). Macaroni and Cheese shaker. On the times when I give in and buy packaged mac & cheese, I pour all the ingredients into a large glass jar, put the lid on and give it a shake. It’s perfect for mixing the ingredients and then the leftovers are already neatly tucked away in their storage container. Soak paint brushes. Perfect for containing the messy water, won’t tip over, and cleans up easy as could be. Spare change. We drop our change into one glass jar for milk money and one for charity. We recently brought the charity jar to the bank and it cashed in for $88. Wow! I enjoy saving glass jars as well, but I never thought about the many uses you mention! My one problem in saving jars is the inevitable time-sink in removing the jars’ labels. Do you have any secrets that you use to take labels off? I’ve tried the often-mentioned approach of soaking the jar in warm water, but it never seems to work well. So glad to hear there are other glass jar fans out there! I wish I had a slick label removing process to share with you – perhaps one that involved a solar oven (great for softening honey) or orange essence (amazingly effective at keeping ants at bay), but sadly I do not. We allow the labels to slowly disintegrate over time from washing. It oddly doesn’t bother us to put leftover spaghetti in a peanut butter jar. Although, I do prefer to use typical mason jars without labels for homemade goods like nut spread or pesto.